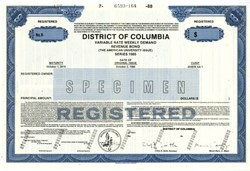 Beautifully engraved Specimen bond certificate from Washington DC dated 1988. This historic document was printed by the American Banknote Company and has an ornate border around it with a description of the bond on top center . This item has the printed signatures of the City's mayor, Marion Barry and Secretary. The American University (AU or American) is a private United Methodist-affiliated research university in Washington, D.C., United States; its main campus is located near Ward Circle in the northwest portion of the District of Columbia. In the late 18th century, George Washington had written about wanting a "national university" to be established in the nation's capital, but it took almost a century for that dream to be established.The university was chartered by an Act of Congress on February 24, 1893, as "The American University", when the bill was approved by President Benjamin Harrison. Marion Shepilov Barry (born Marion Barry Jr.; March 6, 1936 � November 23, 2014) was an American politician who served as the second Mayor of the District of Columbia from 1979 to 1991, and again as the fourth mayor from 1995 to 1999. A Democrat, Barry had served three tenures on the Council of the District of Columbia, representing as an at-large member from 1975 to 1979 and in Ward 8 from 1993 to 1995, and again from 2005 to 2014. In the 1960s he was involved in the Civil Rights Movement, first as a member of the Nashville Student Movement and then serving as the first chairman of the Student Nonviolent Coordinating Committee (SNCC).